8 bar kitchens you'll love! 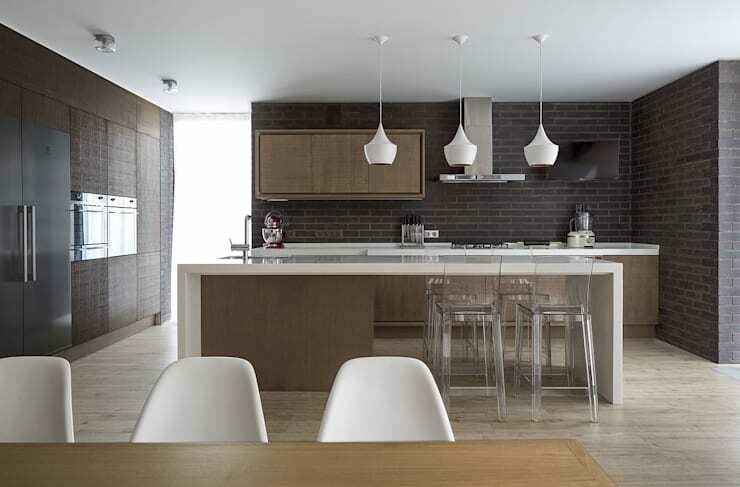 Informality with taste, appealing aesthetics, and style articulates the comfortable modern kitchen space, providing a work surface for cooking, preparing, eating and drinking. Kitchens bars are also a good alternative to optimise space and virtually separate the kitchen from the living area in an open-plan home. Modernising or restoring the kitchen bar is thus a good start to change the face of the kitchen and enhance this room as a wise investment. 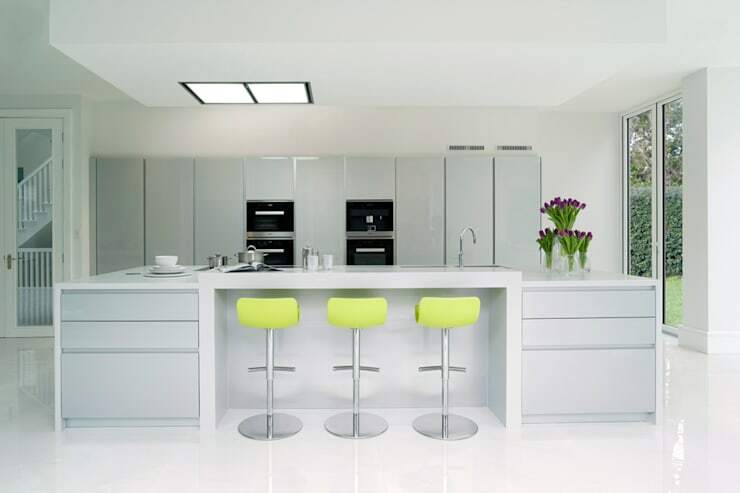 Take a look at these alternative kitchen bars, it will motivate you to evaluate options and change what you need to change in your own kitchen. We wish you success! 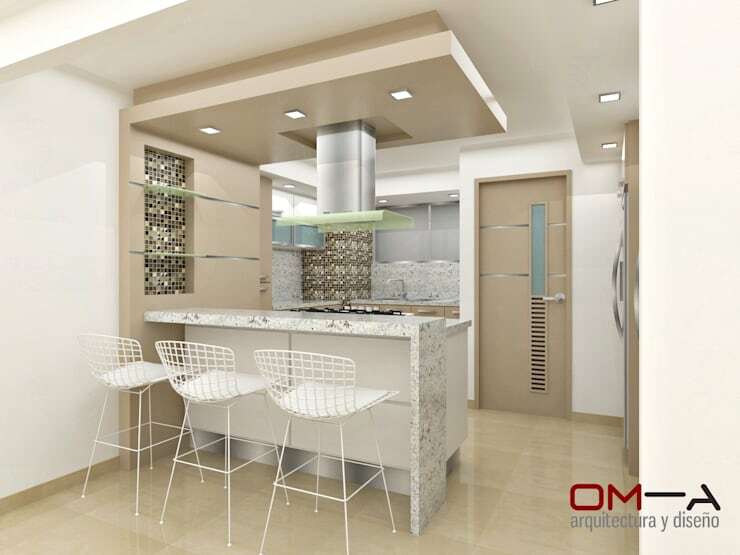 OM-TO Architecture and Design presents us with a minimalist design for a breakfast bar island, starting from the wall. This alternative occupies discrete space and meets the goal, which is to enjoy time amidst the informality of food preparation. This is exactly such a bar and somehow reminds us to take a moment to enjoy a snack. In this case, note that the height of the bar is greater than the island, as well as the chairs. This option doubles informality of the space keeps the diners a little further away from the cooking fumes but not the preparation process, as to enjoy interacting with the chef throughout the cooking process. 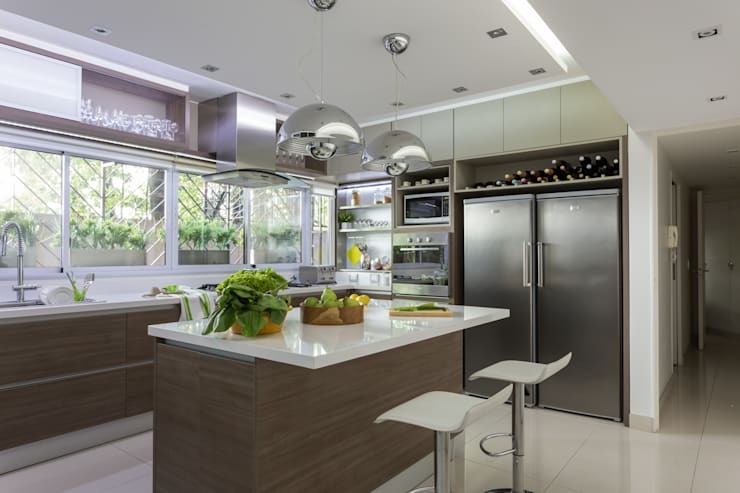 A kitchen island is seen as multipurpose, as it includes space for cooking and washing utensils and tools. It is practically which marries the kitchen island at the right height with a bar at which people can be seated as well. 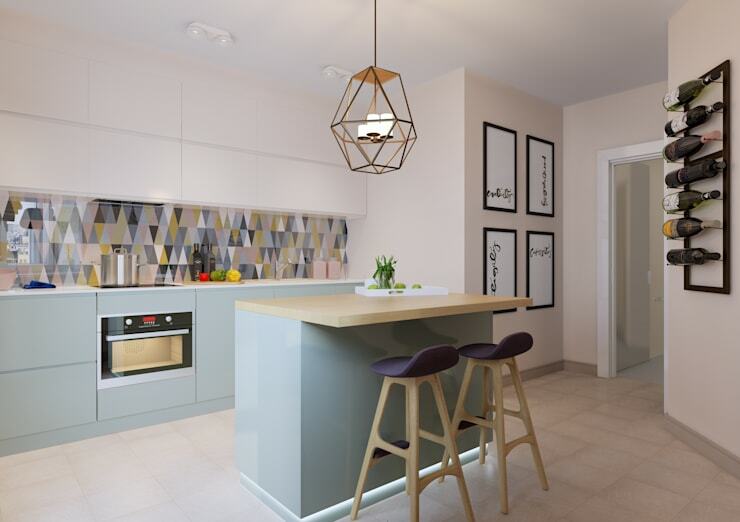 Continuing the theme of practicality and ensuring successful functioning, the island-bar is has two ceiling lamps hanging over it, ensuring a brightly lit work area to prepare, cook and enjoy food. These lamps add a wonder touch, thanks to their stylish design. The stainless steel of which these features are made, gives this kitchen a sleek modern look with a touch of the industrial. For more kitchen islands, take a look at these which you can treasure. An American bar replaces the dining room in this case, creating a situation of optimizing the meters available. Since the materials and the colour scheme are very tasteful, the whole atmosphere is that of great multipurpose harmony and class. The transparency of the bar does not conflict with the limited space, where it seems not subtract volume. The bar is also arranged at a lower level than the island, thus achieving the right height for each use. Tribe Creative Studio presents another element in addition to the options we have seen before. Here they indicate the possibility of eliminating the bar in the future if you want to have only the island, or simply want to change the appearance of the kitchen. This option attracts our attention because of its size and because the bar is complemented by its attractive informality as another alternative option to the use of the dining table. 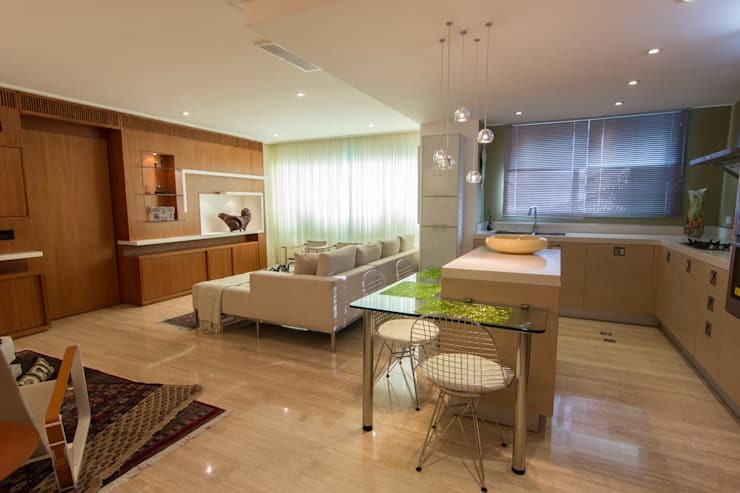 The minimalist design was careful to incorporate transparent bar stools which presence will not subtract from the beauty of the dining room chairs. This whole composition is in harmony, and so we can appreciate such a well-planned space. 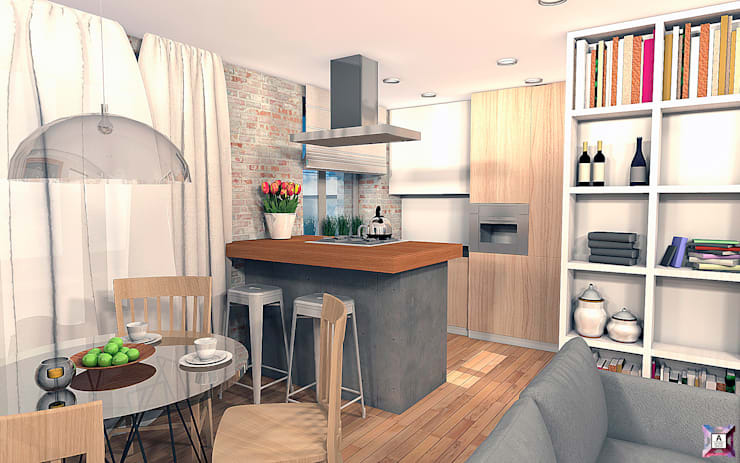 Our next option is an American style bar which extends from the kitchen island in the centre. You really have to assess this design in a set with the rest of the kitchen. It is a youthful, discreet, pleasantly light and beautiful design, perfect your ‘n person or couple’s kitchen. Notice how the geometric patterns fill the space and give it a unique character. The central colour used here is a discreet blue, with the bar stools in a dark navy to stand as brilliant contrast to the pastels in the background. A striking ensemble! In this picture, the bar somehow divides the small space and make it seem tidier. Somehow the bar divides the small space tidying. This bar with an extended height with capacity for two people, is attached to the wall and so creates a harmonious ensemble in a smooth, industrial design. This look is achieved by the concrete base of the bar and the metallic stools which accompany it. 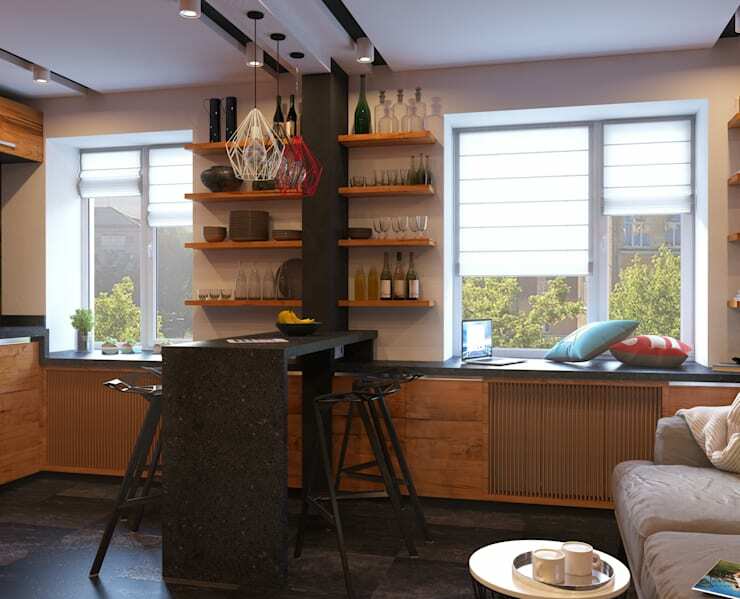 We have seen a few American style bars that support the base of a window, but had not seen a bar between two windows, dividing an environment, integrated into a bookshelf and able to be used on both sides. On the one side is the kitchen and the living room on the other. The design is bold and the roof rail seems to be its accomplice, giving strength to the virtual lines. A minimalist design in an urban colour is presented to us by Urban Myth. Here we can see the reconciliation of the kitchen and home office working spaces. It seems a bit unorthodox, but may have merit in the idea. The informal working environment and sociality to be gained from the arrangement may allow for the generation of creative ideas! Which of these kitchen bars did you like most?